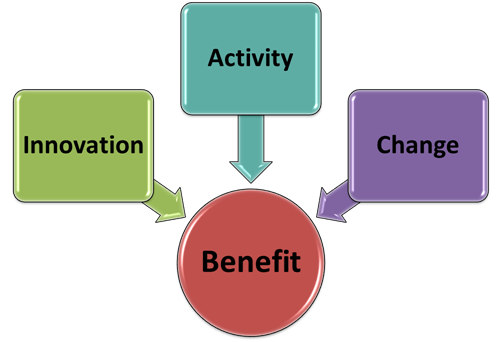 Business Benefit – It’s not just about the money! Business benefit can be manifest in many different ways. Whilst easy to equate benefit with profit and loss, there are other measures that can and should be applied. An unreasoned over-emphasis on finances can be detrimental. For many organisations the financial imperative, whilst important, is not the primary reason why they do business. An organisation that deals with road trauma realises benefit through driving down accident rates and consequentially avoiding increasing their client base. An educational institution realises benefit in increased numbers and quality of students that pass through their system. In assessing business benefit and how it can be achieved it is crucial to first understand what is truly important. Innovation: What can we offer clients that we don’t now? Activity: How can we do things better and what processes can be improved? Change: How can we change to better serve our market and how do we keep keep everyone we work with satisfied? In answered these questions, none of which are independent of the others, it is important keep a focus on why the business exists: what is its mission, vision and goals? Informed appropriately the business can establish its success criteria against which all innovation, business activity and change can be measured. Benefit is achieved with every positive step that closes in on ‘success’.